A Philip Johnson-designed masterpiece, the New York State Pavilion was the shining star of the 1964-65 World’s Fair, charming millions of visitors who flocked to Queens for the two-year celebration. Fast forward to today. After decades of disuse and deterioration, this one-of-a-kind structure is poised for a dramatic comeback…but as what? Presented by the National Trust and People for the Pavilion, and sponsored by Queens Borough President Melinda Katz, the New York State Pavilion Ideas Competition was an “anything goes” approach to radically re-imagine one of New York City’s most iconic buildings and a defining landmark of Queens. 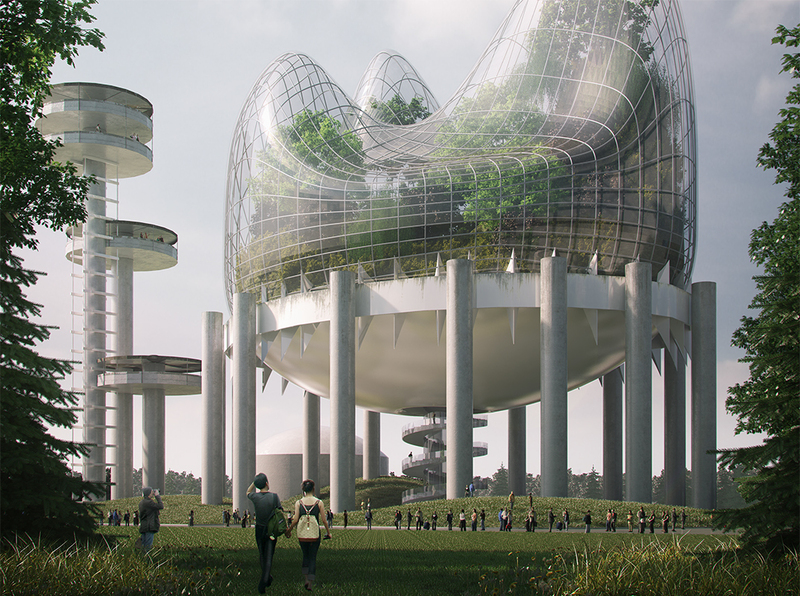 The competition sought to raise awareness worldwide of the New York State Pavilion and its possible futures by inviting anyone to submit their wildest idea for the structure. To lower the barriers to entry that prevent local participation in ideas competitions, People for the Pavilion and the National Trust for Historic Preservation partnered with Queens-based placemaking organizations Híbridos Collective and RPGA Studio, Inc., to hold on-the-ground events in neighborhoods throughout Queens. These events connected residents with artists and designers who helped participants represent their ideas and visions for the New York State Pavilion. The competition successfully engaged the Borough of Queens in re-imagining one of its most significant assets, shone a spotlight on the diversity and vibrant culture of Queens, and sparked the imaginations of thousands about the future of this incredible historic structure. With over 250 submissions collected from around the world between March 1 and July 1, the competition culminates with an exhibit at the Queens Museum (August 5 – August 28) that will highlight the incredible ideas, the winning submissions, and the on-the-ground events that took place in neighborhoods throughout Queens during the competition. People for the Pavilion is a 501(c)3 non-profit organization devoted to raising awareness of the historic value of the New York State Pavilion, and of its potential to serve as a vibrant and functional public space.